Shade is important in large areas like playgrounds and patios. There are various ways to cover large areas with shade. A fixed frame canopy, either free standing or attached to a building with posts at front. 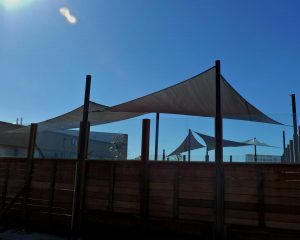 And large tensioned shade sails that attach to larger posts. Shade sails have no fixed frame between the posts and require 3 very strong attachment posts or building anchors. They can have many more depending on site conditions and coverage desired. Because of the larger areas covered these are meant as permanent covers and are not easily removed for winter weather. 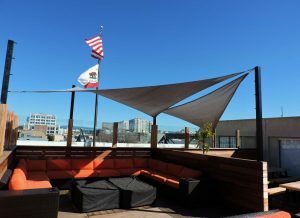 Call American Canvas & Awning located in the San Francisco, CA Bay area for practical recommendations based on generations of experience in creating custom shade solutions for recreation and business. 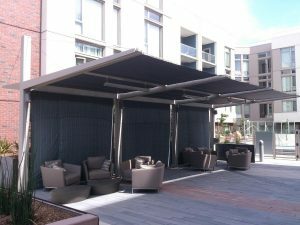 We can create cabanas, fabric gazebos and pergola covers for swim areas and outdoor spaces.